We are pleased to announce that we now carry Tape Applicators for use with floor protection. 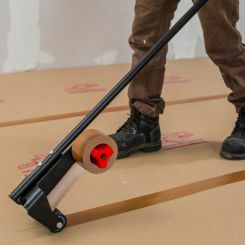 Tape Applicators are a great way to hasten the installation of floor protection. Reusable and easy to use, Tape Applicators are something our customers have asked us about for years. Tape Applicators can dramatically speed up the installation time of floor protection. Products such as RamBoard, CoverGuard, and Corrugated Plastic Sheets can all be quickly laid down and taped together using a Tape Applicator. Our new tape applicators work with any tapes up to 4″ wide. This means that applicators work with standard packing tape, Red Polyethylene Tape, Ram Board Vapor Cure Tape, Ram Board Seam Tape, and nearly every other tape we sell. Each reusable Tape Applicator is $179.99, and can be reused for a variety of protection on numerous projects. In addition to Tape Applicators, we also offer Film Applicators in an array of sizes. The quickest way to apply carpet films, we offer applicators in 24″, 30″, 36″, and 48″ widths, which together handle every size of standard carpet film on the market. In much the same way as tape applicators, film applicators reduce the installation time of carpet films by applying them as they are pushed along, removing the need for manually pulling the film and applying it by hand. This entry was posted in Exciting New Products, Surface Protection, Uncategorized and tagged Coverguard, floor protection, ram board, tape applicator by admin. Bookmark the permalink.